SLCC program recognized as "exemplary" for helping to serve writing needs of students, staff and faculty. The WAC program believes that the writing experience for students cannot be improved unless the writing culture of our entire college is improved. Salt Lake Community College's Writing Across the College program received the 2018 Diana Hacker TYCA Award from the Two-Year College English Association (TYCA) for Outstanding Programs in English for Two-Year Colleges and Teachers. TYCA, which is part of the National Council of the Teachers of English, recognized SLCC's program as "exemplary" in the category of Reaching Across Borders. SLCC's Writing Across the College (WAC) program collaboratively develops initiatives and programs to serve the writing needs and goals of SLCC students, staff, faculty and administrators. The overarching vision is for all people in the SLCC community to respectfully support anyone who seeks to produce high quality, effective writing. 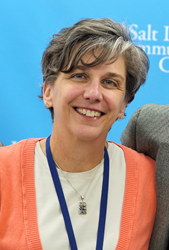 WAC was developed by its director Tiffany Rousculp, who has taught English at SLCC since 1993. She also founded the College's Community Writing Center, which is located at the Salt Lake City Main Library. "The WAC program believes that the writing experience for students cannot be improved unless the writing culture of our entire college is improved," Rousculp says. "When faculty members are supported on their own writing, they recognize themselves as learners who encounter the same fears, insecurities and triumphs that their students do when they write for class assignments." Rousculp says that winning the TYCA award so early in WAC's journey to become an integral part of SLCC illustrates how it is a "forward-thinking" program that is catching the attention of people across the country. Moving forward, she says WAC, which started in 2014, will continue providing workshops, resources and consulting for faculty, staff and administrators to improve their writing and use it effectively in their courses. WAC will also collaborate with other departments and programs to assess writing, shape curriculum and improve learning environments.